Mummy Of 3 Diaries: We've Got The Chill Factor! 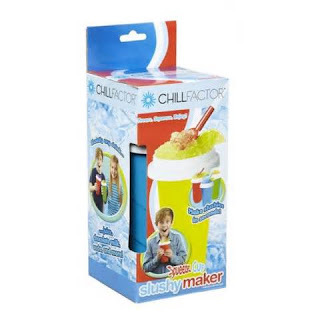 We've Got The Chill Factor - The Chill Factor Squeeze Cup Slushy Maker That is. 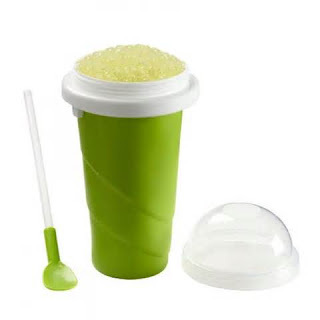 The Chill Factor Squeeze cup Slushy Maker is a unique slushy maker which allows you to make delicious slushies in seconds! 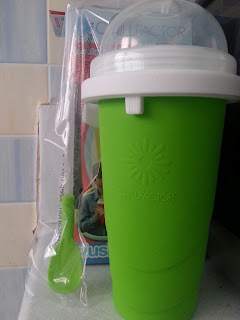 No ice, no blenders, no mess! It's so easy to use - all you have to do is put in the freezer, wait to freeze then add your preferred chilled drink and squeeze! 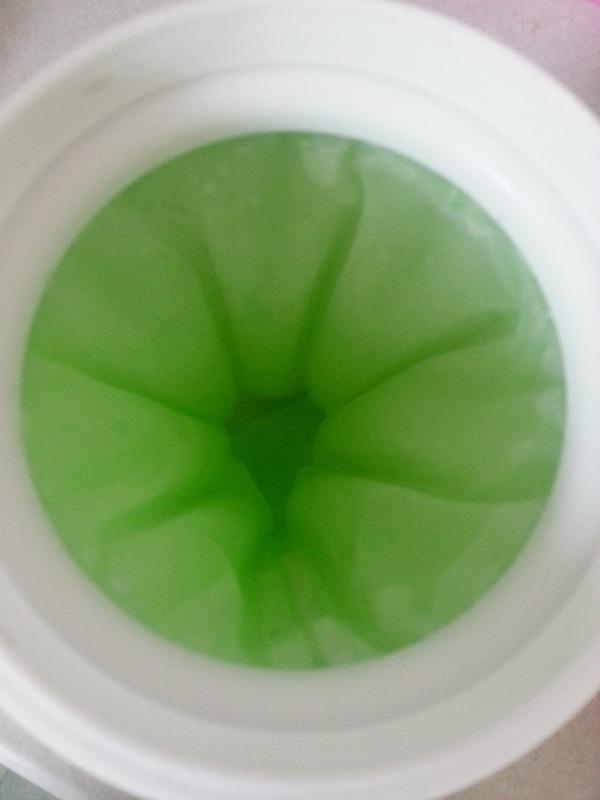 Right before your eyes you will see slushy appear in seconds! Once you have made your slushy you can use the spoon straw included to enjoy! The Chill Factor Slushy Maker from Character is transportable so you can enjoy your slushy anywhere once made! 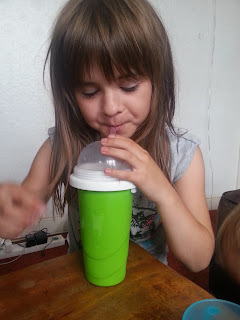 You can create slushies from all your favourite chilled drinks - juices, chocolate milk, soda and more! 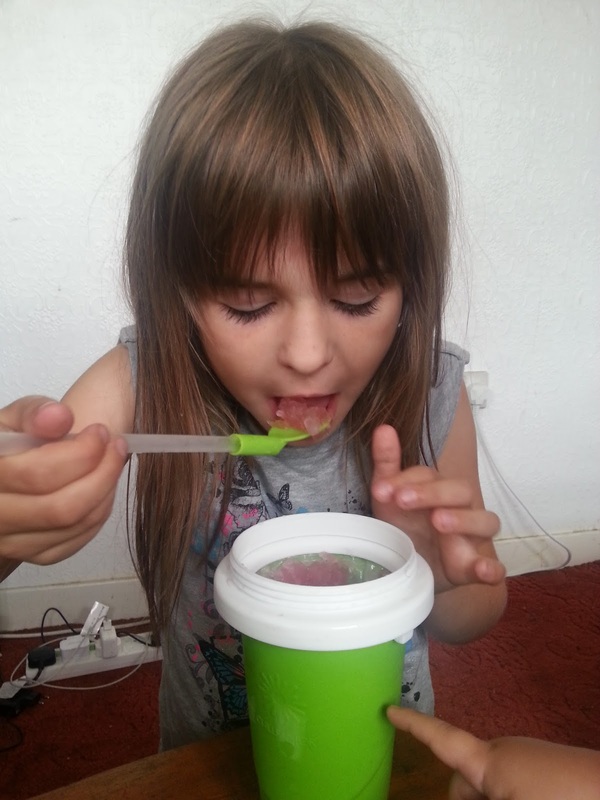 Why not use natural fruit juices to make healthy slushies. Inside the box you get your Chill Factor cup, spoon straw and a instruction booklet. It says to put your Chill Factor cup into your freezer standing upright but our freezer is too small to do this so we had to put it in tilted but don't worry as it still works just the same. 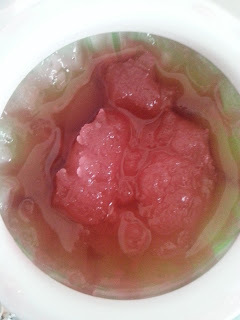 We even tried freezing it lying flat too to see if it would matter. You might get the best results if you do stand it up straight but if you're like me and have a small freezer then don't worry as it will still work. 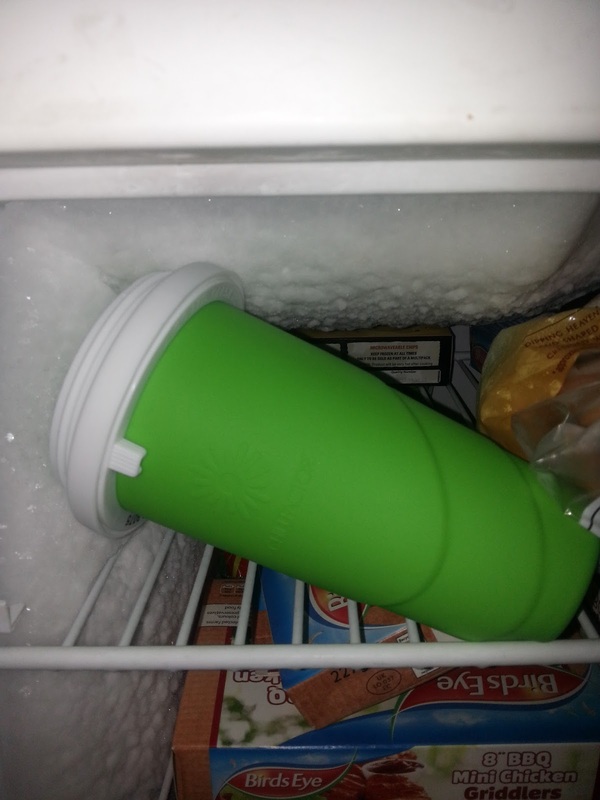 The picture on the left shows how the cup now looks inside after it has been frozen. 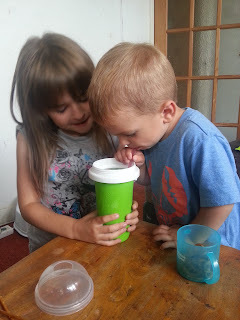 The picture on the right shows what happens after you've added your juice and squeezed your cup for about a minute. It's so amazing, you really do get a cup full of delicious slushy ided drink. 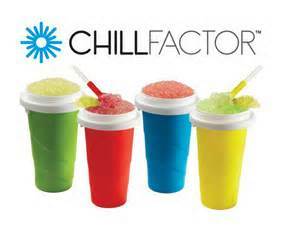 Your Chill Factor is ready to be slurped or scooped or enjoyed in any way that they want. Lily loves slush and now loves her new Chill Factor Squeeze Cup Slushy Maker too! The Chill Factor is so good that we're going to have to get a few more of them real soon before a fight breaks lose. They taste so good that they all want them, one is simply not enough when you have more than one child but for the price of just £12.99 I'm more than happy to now buy them one each. The Chill Factor Squeeze Cup Slushy Maker gets an awesome 5/5 from all of us here at Mummy Of 3 Diaries - it's well worth every penny and even more!